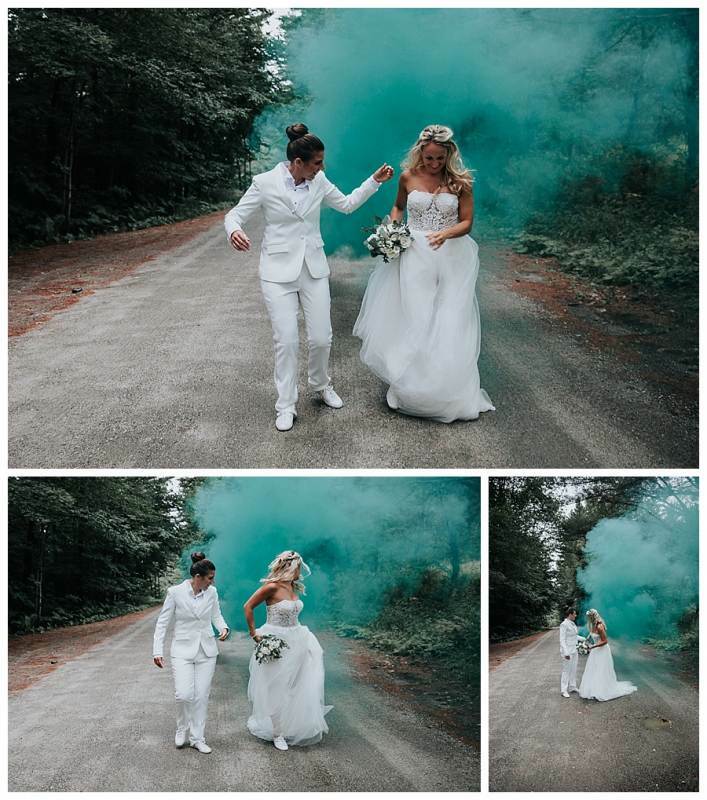 When brides Holly and Taylor came to me requesting to do smoke bomb photography during their wedding couple portraits I told them heck yes! Had I ever done them before? Nope! But I’m ALWAYS down to try something fun and I knew that these two awesome women would be the perfect couple to try it with. 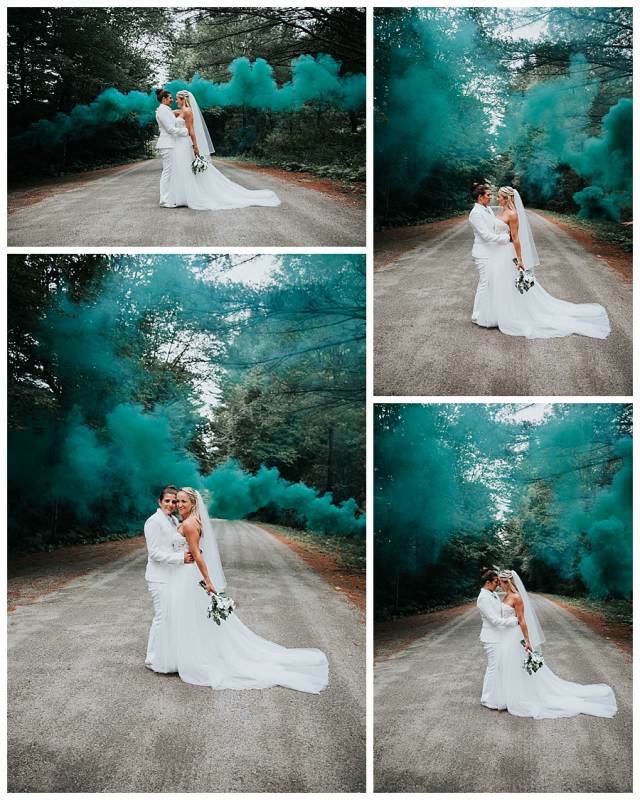 After doing a bunch of research and asking around in some of my photography groups I recommended to Holly that she purchase the Enola Gaye Smoke Bombs from Shipped Yesterday. I was so happy that we went out on a limb and did these! 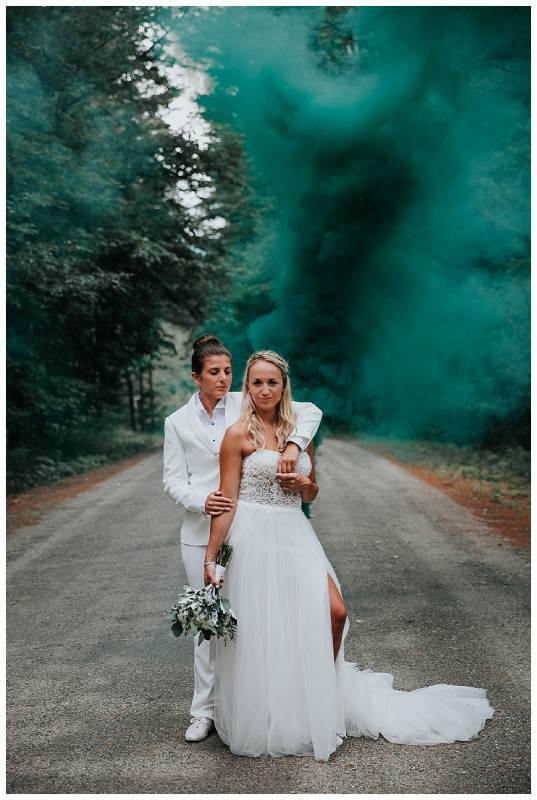 We were all a little bit worried about the smoke discoloring their clothing (they both were wearing white so it was obviously a huge risk!) But even though there was a slight wind in the air and they did walk through the smoke a little bit neither of them were left with any sort of color residue on their clothing. Purchase more than one. Holly purchased two and we used them to get different effects. On the first one we used Holly’s brother-in-law to walk the smoke behind them. The second one we set off and set on the ground right behind them. The shot (at the very top of this post) ended up being my favorite shot from the day! I don’t think it could hurt to have even three or four smoke bombs if you have time especially if you want to do different colors. Pay attention to what way the wind is blowing. Ideally you do this on a day with no wind but if it’s for a wedding you’ll just make do! This is also why it’s a good idea to purchase more than one smoke bomb in case the first one blows away. Use caution if someone is holding the smoke bomb! 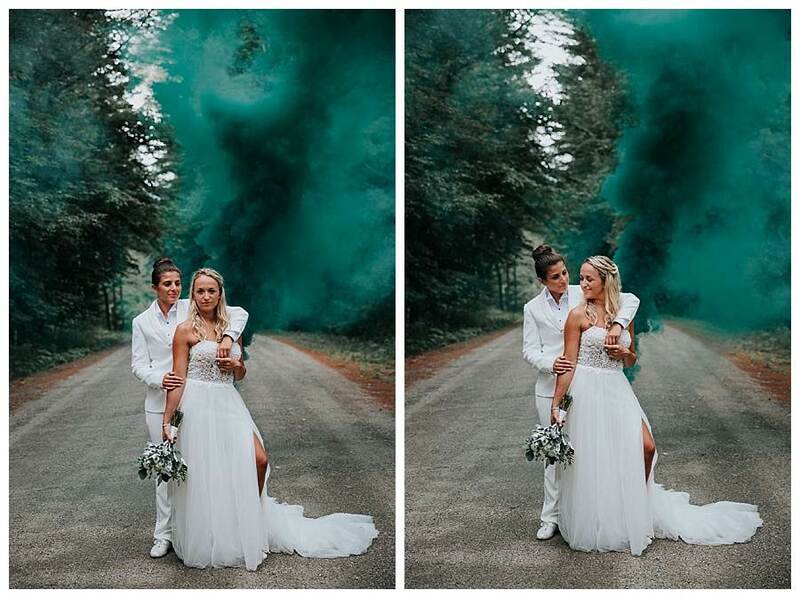 We didn’t have any issue with this since it wasn’t held for very long but I have heard from other photographers that the smoke bomb can become quite hot. 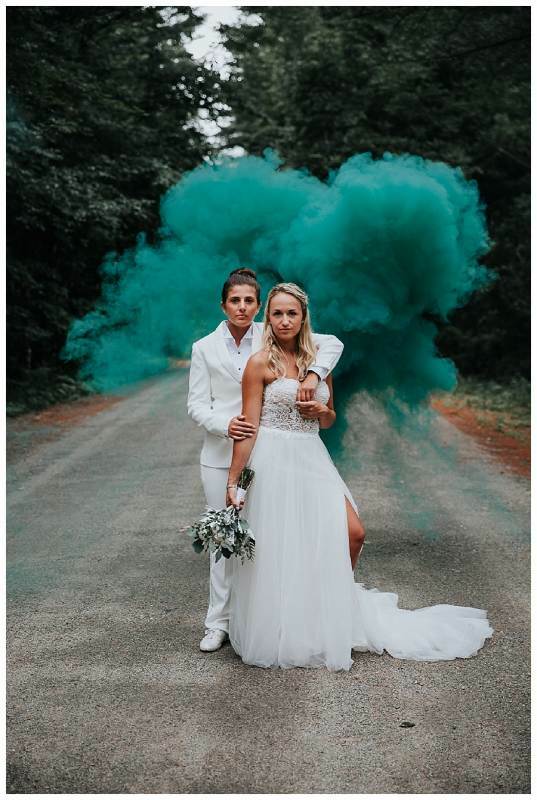 Also, while my couple didn’t have any issue with discoloration (again neither of them held the smoke bomb) if they were closer to the bomb itself I’m not sure what the result would be. I’ve also heard from other photographers that their clients sometimes experienced small burns on their clothing. Use a ton of caution especially if your couple is in wedding attire. Shipped Yesterday says on their website that they don’t recommend people hold the smoke bombs and to do so at your own risk. With my experience the pictures that we took almost immediately after setting the bomb off turned out the best. Even with little wind the smoke dissipates rather quickly. It lasted 90 seconds but once the air is almost all that color it’s a different effect. This was the first set of shots after setting off the first smoke bomb. We had Holly’s brother-in-law walk behind the couple with it lit. You can see that the smoke started to dissipate a bit which gives it a different look. 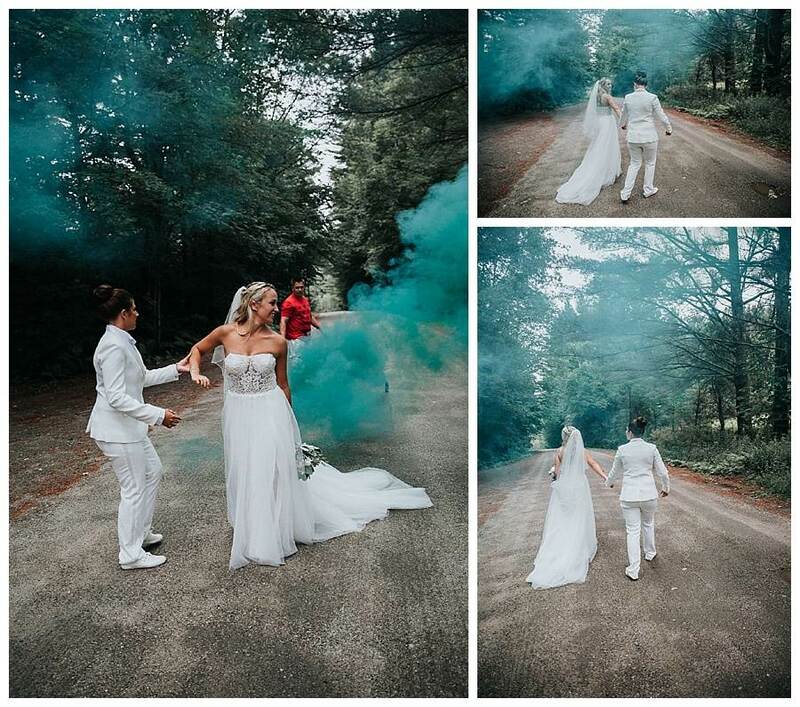 We weren’t totally sure if the smoke would leave a residue on their white clothing so to be safe they walked/ran away from it as it came near. The wind here is blowing the smoke to the side. Still love these shots though! 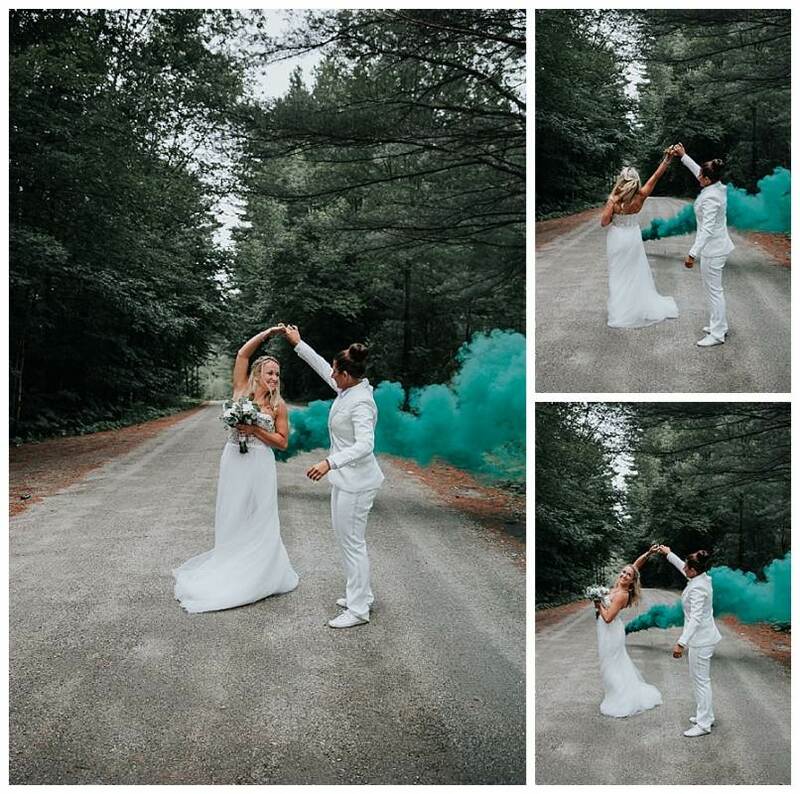 Have more questions about photographing with smoke bombs? Drop them in the comments below!